Do you know someone in your schools or community who has gone above and beyond to ensure the children in your schools are safe? Is there someone in your school who has intervened in a situation that saved lives? Do you have a person in your school community who has developed a program that is having a dramatic impact on the climate and culture of your schools that is making our schools a safer place for teaching and learning to occur? If so, please take this opportunity to nominate this individual for this special recognition. Nominations for this award will be accepted until March 31, 2019. One finalist will be selected from each of the MOSSA regions (provided there is a nominee from each region). Finalists will be identified by April 30, 2019 and will be invited to the award presentation at the 2019 Safe Schools and Colleges Conference, date and location to be announced. 1. Name and contact information of the person making the nomination. 2. Name of the person being nominated. 3. The position the nominee holds in the schools or community. 4. A brief summary (no more than 1 page single spaced) of why this person should be considered for this award. 5. Submitter will be contacted prior to the conference in order to obtain additional information and a photo of the nominee selected as a finalist. 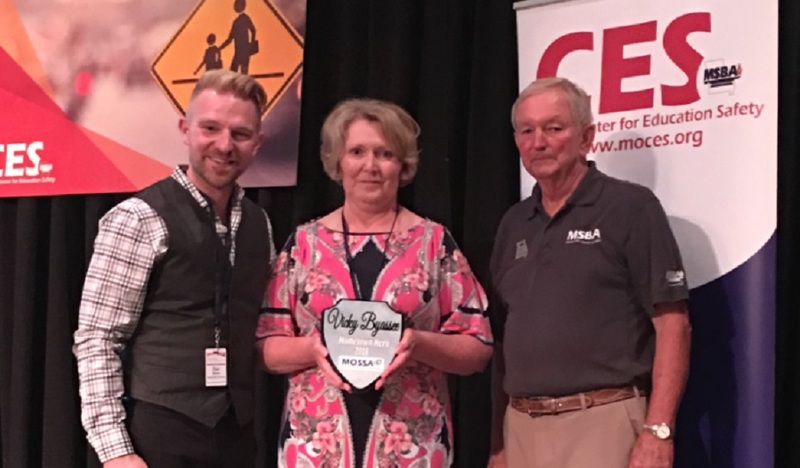 Zac Rantz, President of MOSSA, and Mike Pratte, President of MSBA, present the award to Mrs. Vicky Byassee. The winner of the 2018 “Heroes Among Us Award” is Mrs. Vicky Byassee, Elementary School Nurse at A.J. Martin Elementary in East Prairie. She lives each day “…with a desire to serve others and an opportunity to lend a helping hand.” One Friday afternoon a student not only had a seizure but also stopped breathing. A fellow employee of the school said, “there is not a doubt in my mind that the child is here today due to Nurse Vicky’s perseverance.” Nurse Vicky retired in May 2018. Congratulations and thank you Nurse Vicky, for enriching lives and keeping our students, faculty, and staff at A.J. Martin Elementary in East Prairie healthy, safe, and secure. 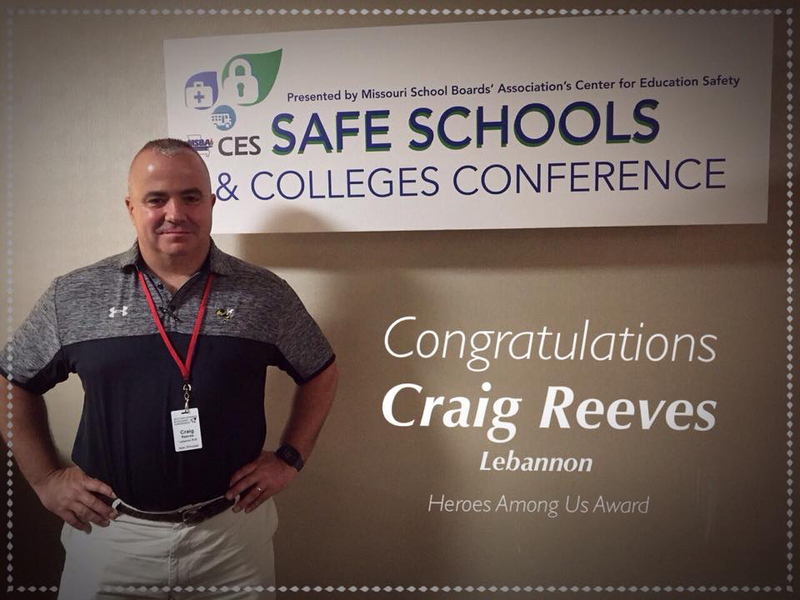 MSBA’s Safe Schools and Colleges Conference recognized Craig Reeves of Lebanon with the 2017 Heroes Among Us Award! Because of Craig’s safety training with MSBA’s Center for Education Safety, he effectively trained his coaches and students to lead themselves to safety when faced with an active shooter situation this spring. Congratulations Craig, and thank you for keeping kids safe!